One of Vinings’ most notable residents did not experience fame or fortune in her lifetime. But Nellie Mae Rowe (1900-1982) is now known as an important self-taught artist, whose works are held in the Metropolitan Museum of Art and the Smithsonian American Art Museum, among other respected institutes. Born in Fayetteville, Ga., Nellie Mae was the ninth of 10 children. Her father ran his own farm on rented property, and supplemented his income as a blacksmith and by caning chairs. Her mother was a talented quilter and musician. After fourth grade, Nellie Mae quit school to work with her father and siblings in the fields, then ran away from home at age 16 and married a young man named Ben Wheat. The couple followed relatives to the rural Vinings area in 1930. Just a few years later, Ben died from complications that developed after he was kicked by a mule. Nellie Mae lived with relatives for about a year before marrying a local older widower, Buddy Rowe. He built them a three-room house at 2015 Paces Ferry Road. 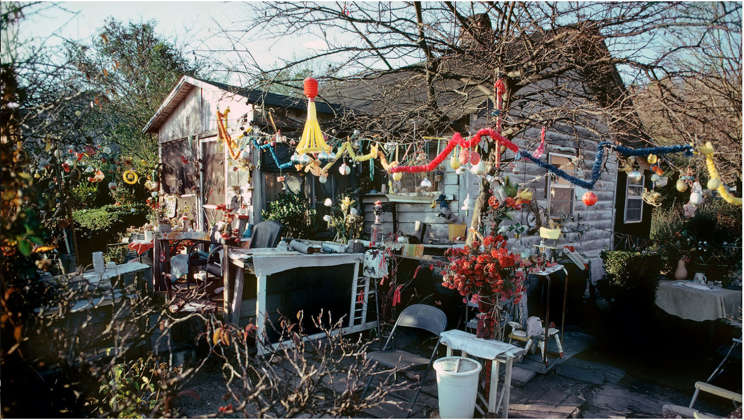 After Buddy’s death in 1948, Nellie Mae began to transform their house into her art studio, calling it her “playhouse.” She also decided to decorate her yard with her art. There were handmade chewing gum sculptures on the fence posts, drawings affixed to the house, large dolls sitting in chairs, and other objects, such as dinnerware hung from trees, Christmas ornaments and plastic images of Jesus. The flamboyant exterior decor did not conform to local standards of taste and propriety, and the property was often vandalized. 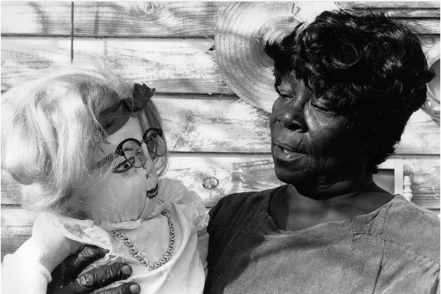 People assumed Nellie Mae was crazy or that she practiced voodoo. By the 1970s, however, her home became a prominent local attraction. From 1973-1975, more than 800 people toured the house and yard, and signed her guest book. During the final years of her life, Nellie Mae’s art received national attention. 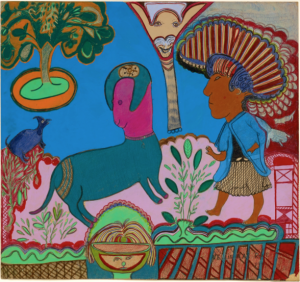 The Atlanta Historical Society’s 1976 exhibit, “Missing Pieces: Georgia Folk Art 1770-1976,” marked her debut. It was here that Judith Alexander, a young art enthusiast and collector, first met Nellie Mae Rowe. The encounter had a lasting impact, with Alexander representing Nellie Mae and promoting her artwork nationally for the rest of her life. 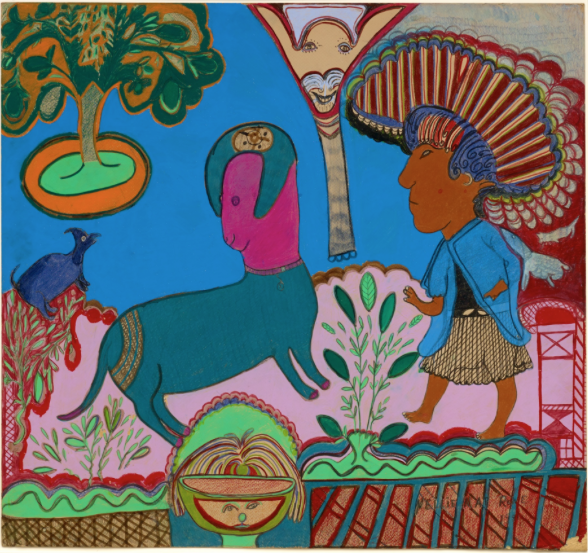 Although she is best known today for her colorful works on paper, Nellie Mae worked across mediums, creating drawings, collages, altered photographs, hand-sewn dolls, home installations and sculptures. Her work focuses on race, gender, domesticity, African-American folklore, and spiritual traditions. Real and fantasy were often merged through hybrid figures such as a dog/human, a cow/woman, and a butterfly/bird/woman. Nellie Mae died in 1982, at age 82, of multiple myeloma. Her “playhouse” was eventually torn down, and a hotel now stands on the site. Nellie Mae Rowe Where Did You Go?